Make consomme: with water, boil the chicken until ripe. You can cut the chicken into small pieces, or you can make small meatball chicken. To make small meatball chicken: Blend the chicken until soft and make a round pieces call meatball. Cut carrots into small quarter pieces. Cut sosis into small pieces. Put in consomme, add chicken and carrots, and cook in a few minutes until carrot half done. After that, put in sosis, suun and mushroom. Add salt and sugar to taste, cook until ripe. 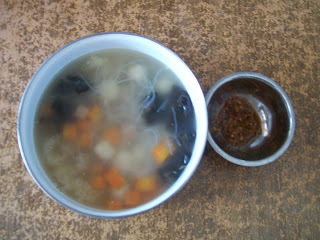 Healthy Soup is ready to serve, serve in hot condition because it can be more delicious.